They say you’re meant to eat breakfast like a King, and Kazbah is more than happy to take on that challenge with their Banquet Breakfast Feast, taking it upon themselves to feed you until you’re stuffed, and then proceed to bring out dessert. Usually available only for bookings in groups of eight, they have decided to shrink the serving sizes to allow groups of 2 to sample the feast for the New South Wales Food and Wine Festival at $30 per head, bubbly included. We start off with a Turkish Coffee, because when in Rome right? It had fabulous caramel notes and its strength was only tempered by the sugar that was added. There was none of the burnt aftertaste that I always associate with darkly roasted coffee, and finished smooth on the palate. It sure provided one heck of a caffeine hit though, and we needed it for the food coma that was soon to follow. They started us off sweet, with a trio of breakfast grains and cereals. Sweet Cous Cous, Saffron Rice Pudding and Barley and Oat Banana Porridge set the scene for a breakfast in the middle east, and “sits on your stomach like a sack full of quarters” (Anthony Bourdain, No Reservations, Season 4, Ep 18, 16:10). We were advised very early on not to fill up on these, but I can’t resist the comforting starchy texture of a rice pudding or porridge. In fact, the Rice Pudding with Saffron-Poached Pear (with it’s beautiful notes of vanilla and orange zest) reminded The Boy very strongly of what he used to have as a kid: Haleem, which is a creamy porridge made from whole wheat berries. The Sweet Cous Cous with Dried Fruit, Stewed Rhubarb and Cardamom Milk presented like breakfast cereal with a twist – the cous cous is cooked in a rose and cinnamon spiked liquid, topped with sweet dried fruit, and served with a warm, frothed cardamom milk that you pour over the top. Then the tagine: a half and half of Roasted Pumpkin on one side, and Lamb on the other. Usually marked by the high conical cap that tops the shallow dish that holds the food, the tagine, much like the paella, actually refers to the stewing pan and not the food. In this one, the Roast Pumpkin was sweet and light, and y’know, good, but it wasn’t the lamb. Oh the lamb. Spiced lamb mince (secret spice mix recipe and all that) lays thick and rich on the bottom of the tagine, couching a baked egg that retains its oozy yolk. Grilled bread on the side, of course, because you need to be full, right? If I die from being overfed tomorrow, I’m just glad that I have had this lamb. Then more savoury, because you can’t have breakfast in Australia without bacon and eggs. 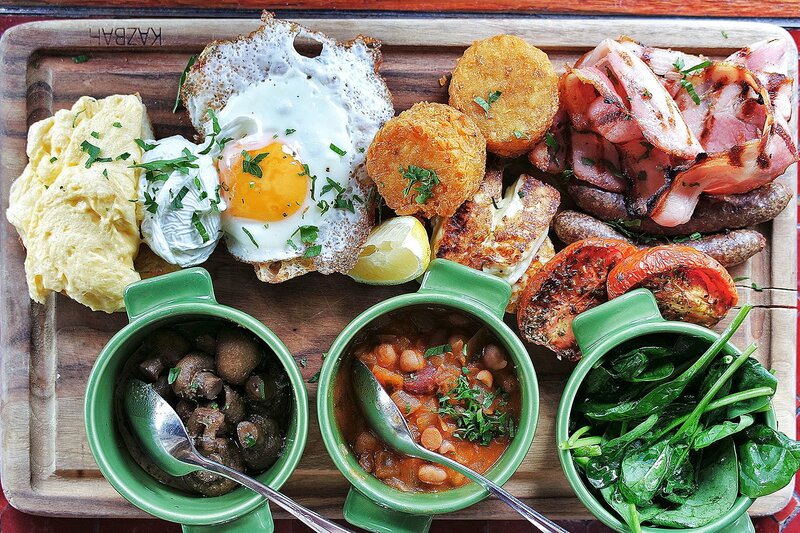 Laid out on a wooden platter were eggs done three ways (scrambled, poached and fried), hash brown, toasted bread, bacon, roasted tomato, grilled haloumi, stewed mushrooms, baked beans and spinach. It was quite a luscious platter (though not quite as amazing as the lamb tagine) and I really needed the acidity and tang that the stewed mushrooms provided. The scrambled eggs were a touch overdone for me – maybe to keep it from spreading all over the platter, I don’t know – and the hash browns didn’t quite have enough surface area to fluffy inside as I was hoping for. But really, I’m just nitpicking at this point because my stomach feels like overfilled muffin cups that have been put into the oven, and is resulting in the subsequent spilling out over the waistband of my jeans. Remember how I said that they would feed you till you’re full and then bring out dessert? Well here is dessert. Chocolate and Raspberry Pancakes with Chocolate Fudge Ice Cream and Housemade Butterscotch Sauce. Pancakes larger than your face is drowned in a pool of sauce, and topped with two scoops of ice cream. And thick, too. I’m sure that this is the food coma talking, but I’m not such a fan of the texture of these pancakes. The addition of almond meal and the sheer size of it creates a tough, cakey texture, which is not quite the fluffy, bouncy texture that I’ve come to expect from pancakes. The butterscotch sauce mixed in with rivulets of creamy chocolate ice cream was nice, like a caramel and chocolate milkshake had a baby. This is where the Turkish Coffee really came in handy. I was well and truly in a comatose state from the meal, and needed a wooden barrel to help roll me home. I’m told that these portions are calculated to be scaled down from the 8-person banquet, and the only thing that was left at a larger portion was the pancakes, which usually serves four to six. I could have easily been full if The Boy and I shared this with another four people, and with a bag full of leftovers, I can safely say that neither of us ate for the rest of the day. And maybe that is the point of a middle eastern breakfast. You can like a King in the morning, so you don’t have to consume anything until the next breakfast. If you’d like to try this luxurious breakfast, it is still available at Kazbah in Balmain till the end of the NSW Food and Wine Festival on the 1st of March. Visit www.nswfoodandwine.com.au for more details. Insatiable Munchies dined as guests of the NSW Food and Wine Festival.